Eating too much has always been a struggle for me between just being a food lover and also using it to cope with stressful situations. 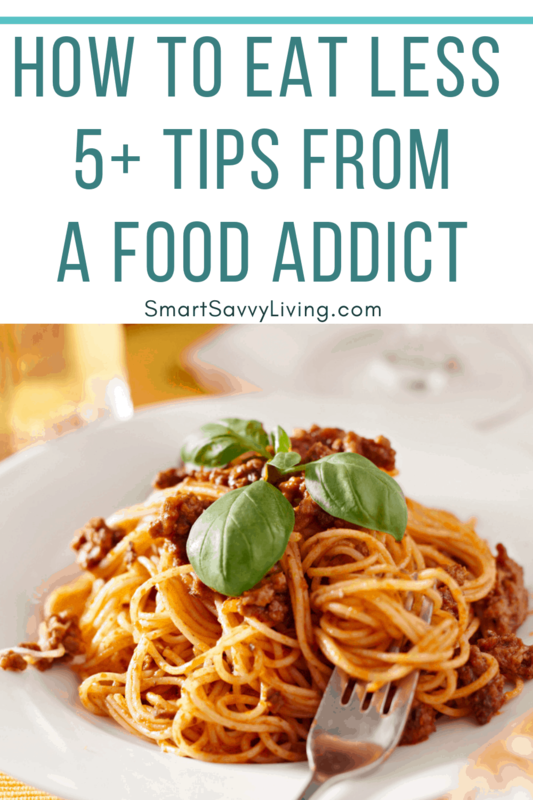 That’s why as a food addict I use these 5+ tips for how to eat less daily. Hello. My name is Michelle and I love food. I’d even go as far as to call myself a food addict. I’ve always loved cooking and food seems to be on my mind a lot of the time. It’s not unusual for me to be thinking about dinner tomorrow before I’ve even eaten it today. Part of that is because I’m always trying to think of recipes I’d like to create. Part of it is because I just love food. Food has always been the “drug” I turned to when stressed, happy, or pretty much any other emotion. It’s true that in the south just about everything is celebrated, mourned, or remembered with food. I have had success in curbing my emotional and stress eating by trying to replace it with a positive action such as exercise. But, I still love food and often find it hard to eat a healthy portion at my meals unless I’m really proactive about it. At one point in my life, I weighed almost 400 pounds. I then got below 300 and then would go up and down the scale a few years. Then a few years ago my appetite started to decrease. Part of that was because it was something I proactively worked on. 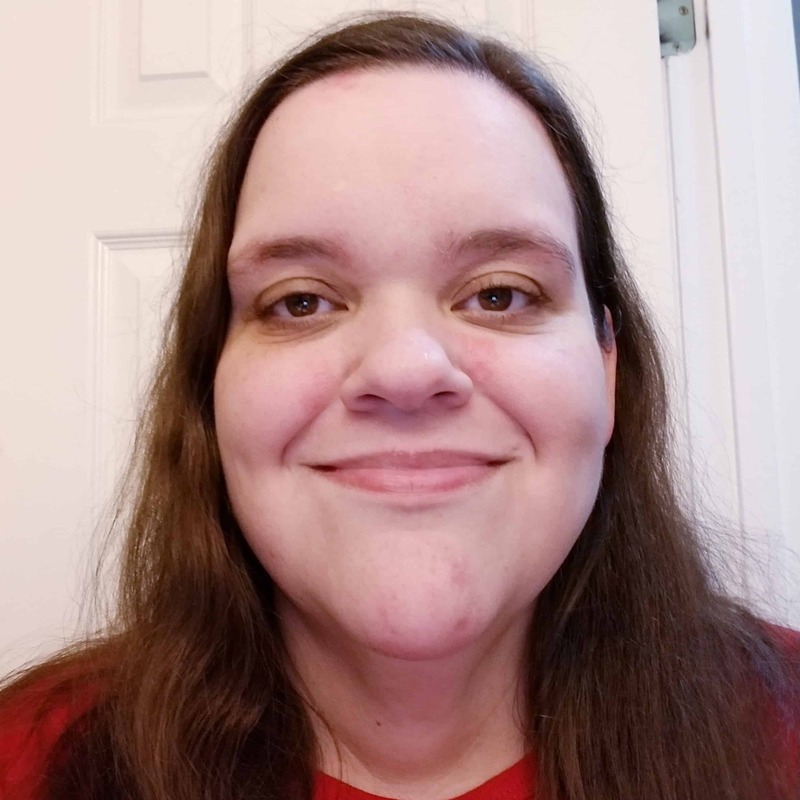 But it eventually got to the point where I didn’t want to eat at all, along with other health issues, and I discovered I had what ended up being an 82-pound mass on one of my ovaries. Thankfully not cancerous. As I’ve recovered from the surgery to have it removed, it’s become more important than ever for me to control my eating habits. I now weigh less than I did in high school and want to keep it that way and continue to lose more as I am still obese at just under 5’3″. After several months of having little to no desire to eat even my favorite things and now feeling hunger again and the feeling of kind of wanting to make up for lost time makes not overeating quite difficult. Here are several tips for how to eat less that I implement in my daily life, which helped me lose weight originally and now keep it off and continue to lose more. As always, let your doctor and other medical caregivers know of any changes you’re making to your diet before you begin. 1. Drink more water. 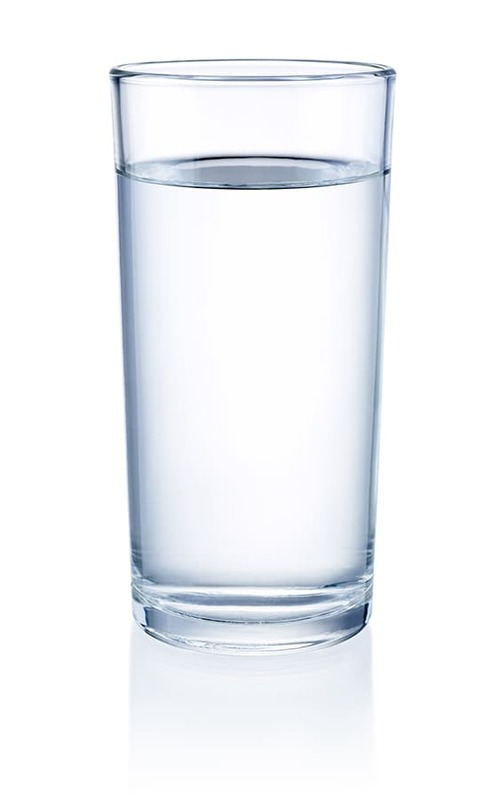 I know, we all get tired of hearing that we should drink more water. However, did you know that often times when you feel hungry it’s actually because you’re dehydrated? Instead of filling up on just juice and soda in the morning and afternoon, be sure to have a glass or two; of water as well. When I feel hungry but it’s not time to eat, I always have a glass of water or unsweetened tea and find it usually really does help my hunger pangs. You just might even feel more awake, too. 2. Fill up on fiber and protein; don’t be afraid of fat. No, you don’t have to constantly have a carrot or stalk of broccoli in your mouth. But if you make the majority of your diet fiber (fruits and veggies), proteins (meats, dairy, nuts, and seeds), with some healthy fats (olive oil, coconut oil, real butter, avocado, etc.) the longer you’ll feel full. Yes, I did say fat. More and more research is showing that healthy fats aren’t as terrible for us as we once thought and, in my experience eating more fat helps me stay fuller longer. This doesn’t mean eat a pound of bacon a day or have everything swimming in butter. But, don’t be afraid to season your veggies with a pat or 2 of butter (makes them so much more delicious to eat!) or to go for the cut of meat that isn’t super lean, or put some real mayo on your sandwich and creamy salad dressing on your salads. If fruits and veggies have never really been your thing that’s okay. I don’t eat much fruit because it raises my blood sugar too much. But I’ve grown to love veggies. Vegetables like broccoli, brussels sprouts, and green beans are delicious sauteed (not boiled to mush) in butter or a bit of bacon fat with garlic and a sprinkle of salt. You might just find salads really can be delicious with a salad dressing you love. Go slow with implementing fresh produce into your meals and see what you like. Check out my post on how to make healthier foods taste better as well. It really does help! I also eat a good bit of protein. If I don’t, I definitely notice an increase in my hunger. I’ll have a handful of nuts or sunflower seeds when I really really need a quick snack or to give my salad some crunch. I also regularly enjoy fattier cuts of meat like 85% ground beef, steaks, pork and beef roasts, and chicken thighs. They have more flavor than leaner cuts, which I still eat too, and, again, the fat in them helps keep me full. 3. Consider reducing the sugar. Before my surgery last year I did several months of low carb eating. Since I feel like eating again now, it’s not a way of eating I’ve returned to though I may in the future. Part of low carb eating is cutting out sugars. I definitely notice a huge difference in how much I want to snack and eat overall when I consume a lot of sugar, especially soda. As such, I try my best to limit sugar to weekends. This means I make a point to not have soda (I personally try to not use artificial sweeteners), sweetened tea or coffee, desserts, or a lot of processed foods (take a look at the label and you’ll probably be shocked how many have sugar – and a lot more than you’d think) during the week. Knowing that I can eat and drink those things on weekends is usually enough to keep me from giving in. I do have a history of binge eating sweets, though, so if I just can’t shake that craving I will have a piece or 2 of just chocolate or a handful of honey glazed mixed nuts. 3. Eat slower with smaller bites. In this day of constant rushing and working all hours it’s easy to spend 10 minutes scarfing down a meal. However, it can take a half hour or more to actually feel full. I find that slowing down and eating smaller bites really helps me eat sensible portions without needing to reach for a second serving or extra bag of chips. Plus with smaller bites, I tend to skip second servings even with foods I’d like more of just because I love the taste because the food lasts longer. I actually feel like I’m eating a second piece of chocolate cake if I turn one piece into 12 bites instead of just 6. Plus, by slowing down I give myself the time to really enjoy it instead of just going through the eating motions. 4. Eat on smaller plates. Last year we got some new plates and the dinner plates are huge – probably at least 1.5x the size of our old plates! If I filled up the new plates with food I can only imagine how many more calories I would be consuming. Instead, I eat off of a smaller plate. It’s amazing how seeing a full plate of food can trick your brain into feeling like you’re eating more. 5. Turn off distractions while eating. This one goes a bit hand in hand with number 3. Do you ever get so preoccupied with work, TV, or whatever you’re doing that you eat a half of a bag of chips before you realize it? Yep, me too. That’s why whenever I have a meal or even a snack, I try to sit and just enjoy the food if possible. No working, chatting on Facebook or watching TV. I find this helps a ton with cravings and not mindlessly eating because as odd as it may sound, I actually experience eating the food rather than being so distracted I don’t really even taste it. 6. Keep food put away. It sounds a bit silly but I’ve found that if food is out of sight, it’s also out of mind. If I’m not constantly seeing food, I don’t even really think about it until I actually start feeling hungry. If I see the candy or bag of chips on the coffee table or my desk, it’s easy to think hey, that sounds good and reach in and grab a handful. If food is put away in the pantry where I’m not visually reminded and then have to take the time to go get it, I’m not as prone to snacking. I also don’t take the whole bag or container with me when I do get something. I’ve learned to try to stick to eating at mealtimes instead of snacking all day, but when I do choose to snack I get out a serving size and put the rest away. That way I’m not distractedly eating too much and if I truly want more then it has to be worth stopping what I’m doing to get up and get it. I know it sounds incredibly lazy but you just might surprise yourself with how many times the snack is no longer worth it when you put that stipulation on it. 7. Consider eating less often. Over the past year, I’ve become a huge fan of fasting. Fasting is in no way starving yourself on purpose as many people seem to think. You eat the same amount of food, sometimes even more food, but you only eat a couple times a day, spiking your insulin much less often, which helps with weight loss. Think of it more as time-restricted eating. I know, it’s much different than the 3 meals a day with snacks in between that’s been drilled into our heads for years. I got into reading about fasting from Dr. Jason Fung and Delay, Don’t Deny when I was having a lot of digestive issues last year and my weight kept going down and then back up even though I wasn’t eating much. 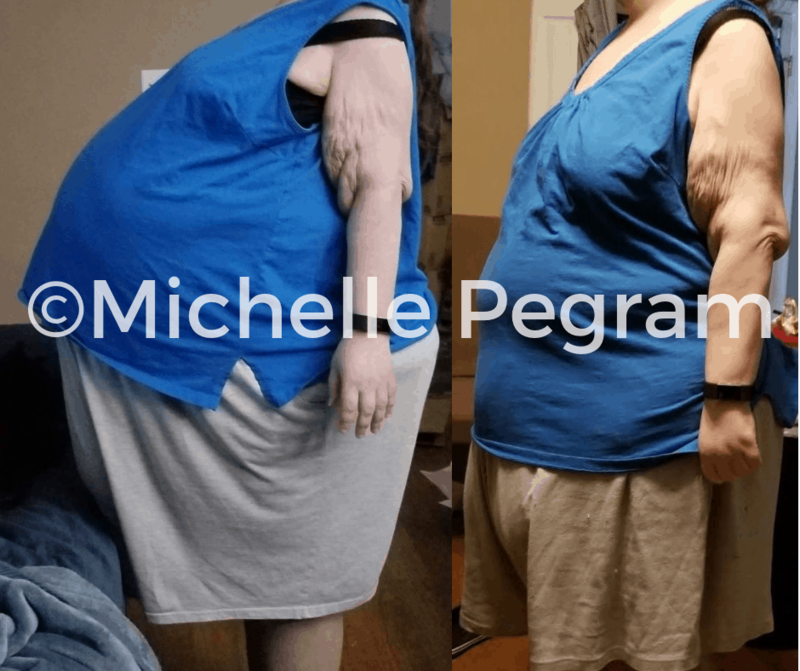 First, I wanted to know if I was hurting myself and my metabolism by having a day here and there where I ate 2 – 3 serious meals but then maybe went a few days with eating very little, if anything. I know that mentally I felt the best I had in a long time but I wanted to make sure I wasn’t hurting other things. I learned that basically if you have fat stores your body can feed off of, and I had plenty, that you’ll usually be fine as long as your keep your electrolytes in check. And that fasting can indeed help you lose weight and even help heal some of the issues in your body over time. I attribute my fasting and lower carb eating, even if I didn’t know that’s what I was doing at the time, to helping me lose the weight even while my ovarian mass was growing. After all, at one point in life I weighed more than I did even when I was unknowingly carrying around an 82-pound mass. So fasting, or time restricted eating, definitely helped me lose weight both before and after my surgery. As I mentioned before, I no longer restrict the things I eat, just when I eat them. I usually have a window of 2 – 8 hours a day that I eat, which usually ends up being 1 to 2 meals a day. I try to not snack and if I want snack-like foods, they are just part of the meal. It has helped my blood sugar and appetite control a lot. It’s not easy at first but give it some time and slowly increase the amount of time you don’t eat and it just might work well for you. Most days I don’t eat until 2pm or later in the day. I then try to break my fast with some protein and/or vegetables versus a lot of carby snack-like food, because they usually make me want to eat a ton and keep snacking. If I’m still hungry after the meat and veggies, then I have the carbs such as pasta, rice, and bread or dessert. I’m mostly full by then so I don’t feel nearly as tempted to pig out on them or turn them into an entire meal itself. Implementing ways to eat less can be tough at first, but if you strive to stick to them at least 4-6 weeks, it becomes an easy habit! What are some of the things you implement for ways to eat less? Eat mindfully. Drink water before meals and with meals. Great ideas, drinking water always makes me feel more full!